Back of card: Looks like a mottled, dark, old wood plank. In the center is a round object of some sort (about the size of a small closed pocket watch, perhaps), with "spikes" at 9, 12, 3 & 6 o'clock. In the center: The red Welsh dragon. Above, 5 diamond shapes. Below: 5 diamond shapes. May be inverted. Book included: Yes, 264 pages, 5.15 x 8 inches, or 131 x 203 mm. Illustrated. Introduction by Carl Llewellyn Weschcke, the head of Llewellyn Publications. Also included: A plain drawstring bag. I am informed the earlier bag, with amber beads at the bottom, was for the first few introductory copies only & is no longer supplied. This makes me unhappy. Publisher: Llewellyn Publications. Printed in the US. Comments: Two-thirds of the book is taken up with the major arcana, six to eight pages per card. Descriptions are lavish & include mythical/historical details of the Welsh figures depicted on them. The minor arcana gets a page per card. As you can see above, and with only a few exceptions, the minor arcana are Rider-Waite clones (as are many of the majors, by the way). By contrast to the majors, both the artwork & delineations for the minors are uninspired. For this reason I have shown you more of the majors. 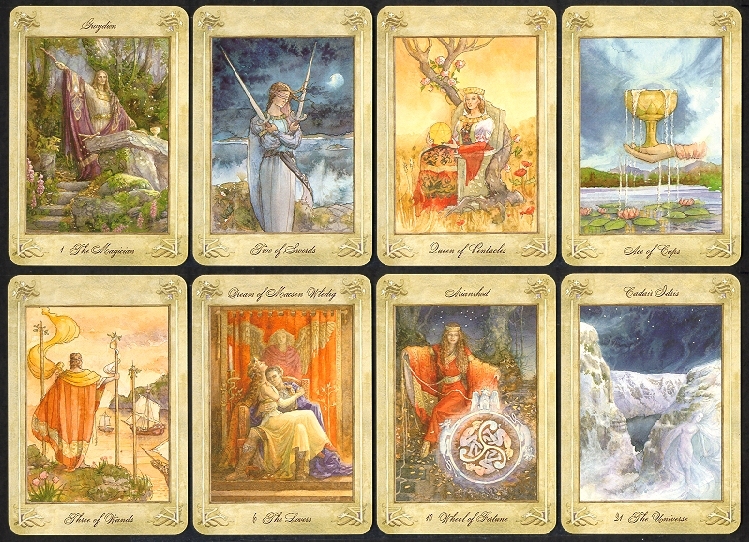 Across the bottom row, left to right: The Three of Wands, The Dream of Macsen Wledig (The Lovers), Arianrhod (Wheel of Fortune), Cadair Idris (The Universe). A fancy script was chosen for the cards. Coupled with strange Welsh spelling, it is difficult to read the names at the top of the major arcanas. I tried just now. For unknown reasons, Weschcke brings up Llewellyn George in his introduction. George was born in 1876 in Wales, came to America as a young man & spent his life promoting astrology, founding the publishing house that Weschcke bought some 40 years ago. Weschcke implies that George was some sort of Welsh mystic, which he was not, and Weschcke knows it. The great 19th century Welsh mystic was Charubel (pseudonym of John Thomas, 1826-1908), for whom Weschcke has never shown any interest.